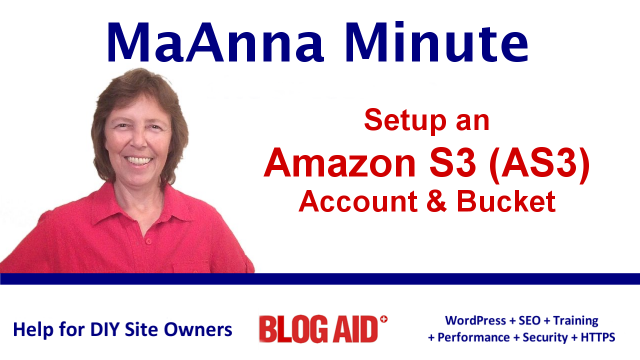 See how to acquire and set up an Amazon S3 account to store your WordPress site backup files and media files such as audio, video, and PDFs. Plus, get important tips for better security. See the notes below the video for extra security on your AS3 account and files. Hackers can get into everything now! Even if you already have your AS3 account set up, you need to take extra steps to secure it. Never use your master AS3 keys in plugins!!! If a hacker ever compromises your site, they can steal those keys. It’s best to create a new IAM User for each bucket. And to create a bucket for each file type. Create a bucket for only your site backups. Create an IAM user that only has keys, not login access. Use those keys with your backup plugin integration. Create another bucket and IAM user for publicly available media files. What if your site gets wiped out or hacked? Good thing you have backup files stored off site, right? What if those backup files get wiped out? This is why you need to go two steps further to protect your backup files. First, restrict your IAM user to only one bucket. That’s done via a Policy rule. Even if a hacker steals the IAM User keys from your plugin, they only have access to that one bucket, not your whole AS3 account. With Versioning, the hacker can’t tamper with previous backup files either. Setting up an IAM User, creating a restrictive policy, and setting up Versioning with auto delete is a little techie. Contact me to help you setup these one-time things. Want to Learn How to Protect Sites? If you’re a designer or maintain client sites, security is a top priority, because that’s a liability for you. And you certainly need to know that the site’s backup files are protected and secure. See Level 2 of my Webmaster Training for full tutorials on AS3 IAM User creation, Versioning, and Auto Delete.